This isn’t really a recipe per se, more so a method. Either way, you should be able to follow along! It’s lunch time here on the East coast and I was craving something leafy. 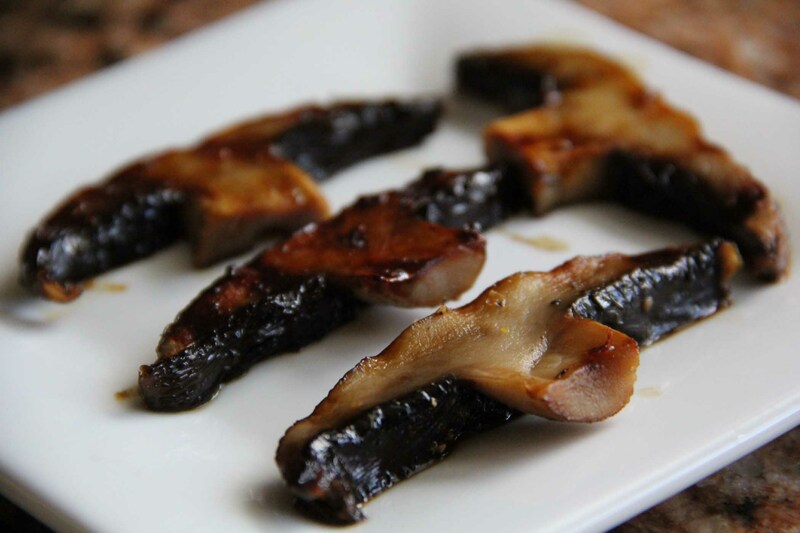 I popped my head in the fridge and saw sliced portobello mushrooms and fresh asparagus waiting for me. 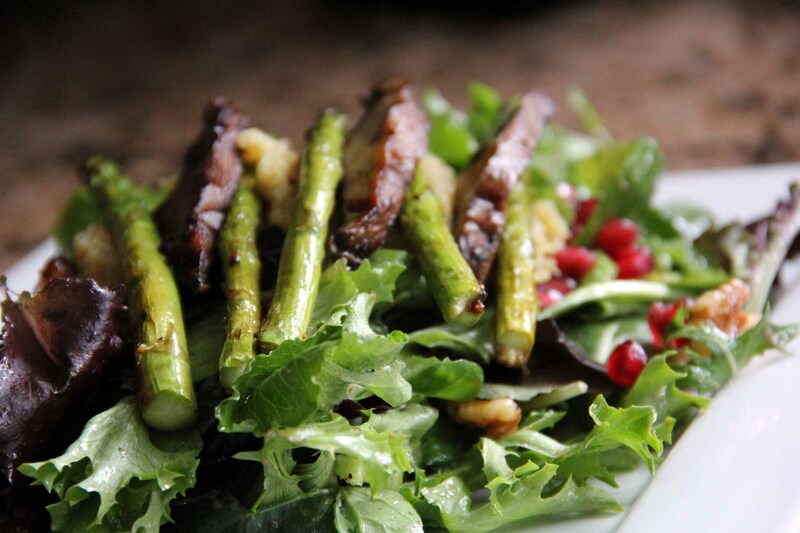 I decided to incorporate them into a salad along with some greens, celery, pomegranate seeds, walnuts and quinoa. 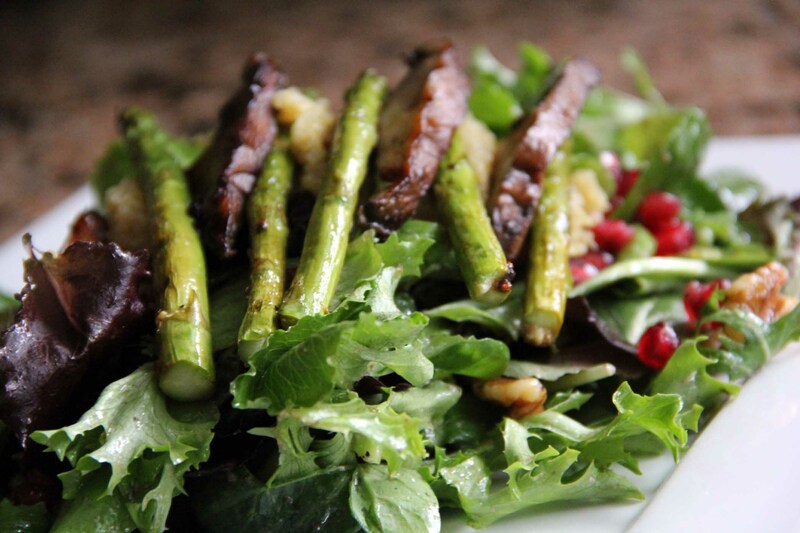 The results were beautiful, filling and a departure from my normal salad routine. First I cooked my quinoa (1 cup, rinsed) in a pot with one cup vegetable stock, one cup water and some sea salt. 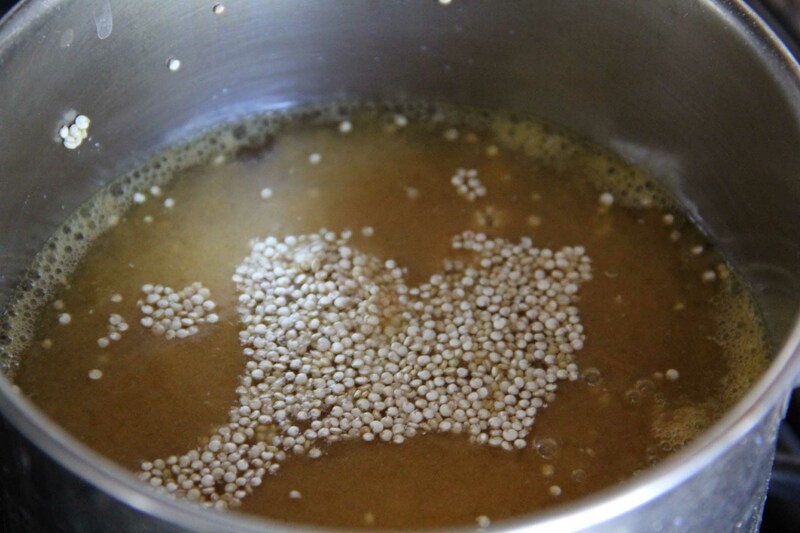 The ratio when cooking quinoa is 1 cup quinoa to 2 cups liquid. Once it came to a boil, I popped on the lid and let it cook for 15 minutes til done. While the quinoa was cooking, I cleaned my asparagus and mushrooms and eye-balled a vinaigrette consisting of olive oil, white balsamic lemon vinegar and some Everyday seasoning from Trader Joe’s. I got out my grill pan, sprayed some olive oil and placed the veggies in. 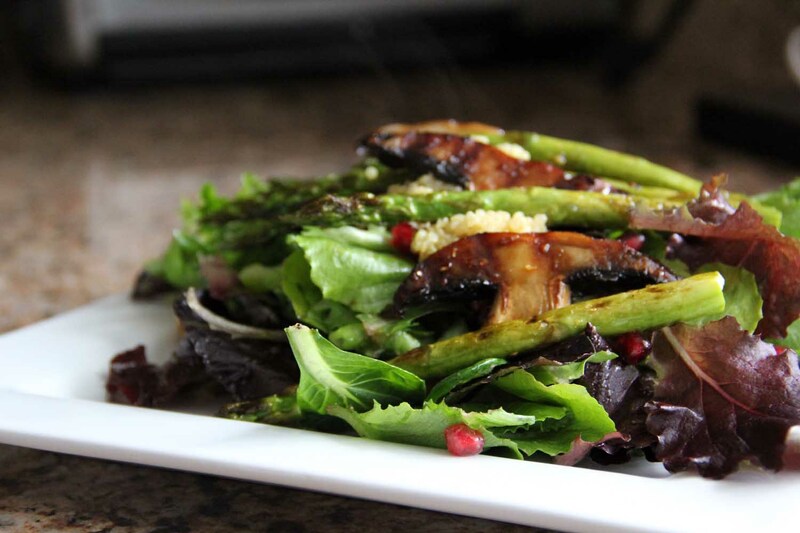 Once they started to cook a bit, I brushed on the vinaigrette a few times while turning and rotating to make sure all the asparagus were cooked evenly. For my salad, I threw together some mixed greens, a stalk of celery (sliced), a 1/4 of a pomegranate (seeds only) and a handful of walnuts. 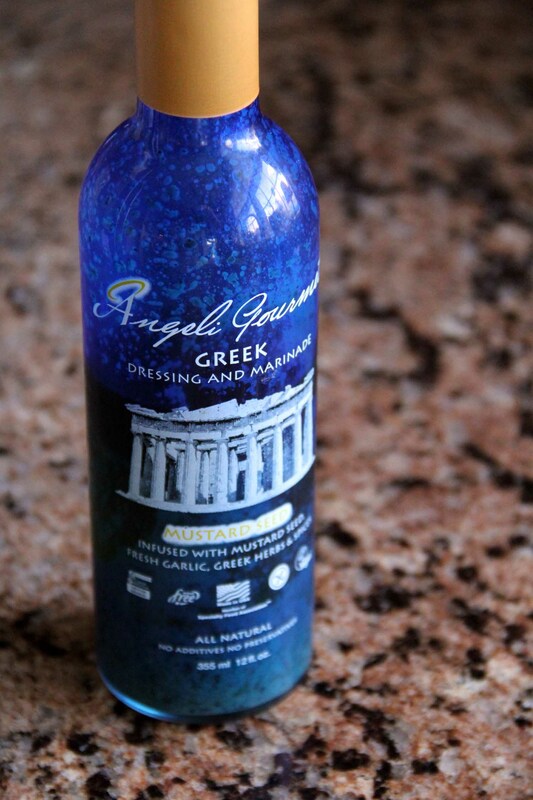 I tossed it all together with Angeli Gourmet Greek Dressing. I typically make my own salad dressings just as a taste preference, but this bottle is one I really love, especially when I’m short on time. I buy it at my local Whole Foods. It’s a nice mix of olive oil, vinegar, spices and not much else. Once my quinoa was cooked and cooled I assembled it all together and chowed down. 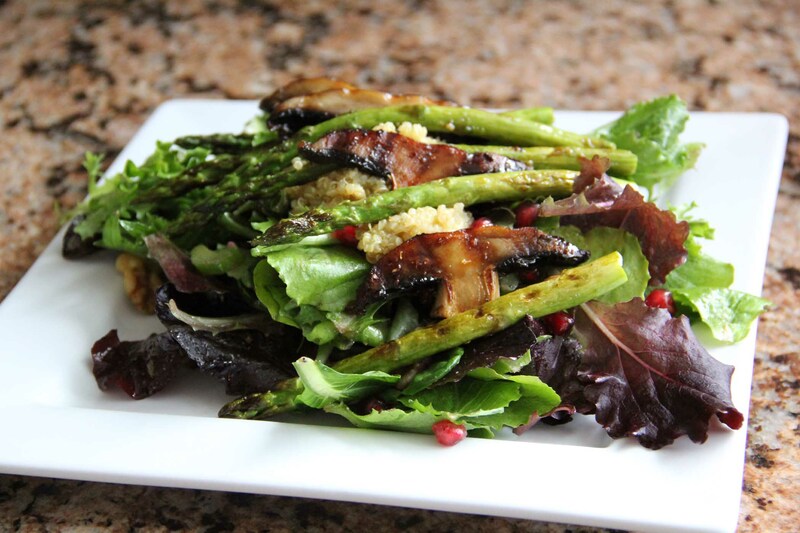 The sweetness of the pomegranate seeds, the smoky/tangy flavor of the grilled vegetables and the mildness of the quinoa went really well together. Suffice to say, I’m full! Enjoy!